The Minnesota winters can be harsh and the storms can be violent in the spring and summer, which is why so many residents throughout the Twin Cities and beyond have standby generators connected to their homes. When the electrical grid fails and you have electricity, having a generator can make life a lot easier. Figure out the appropriate load – It is important to have the right generator, so you can tell the generator salesperson what you wish to load so that the right generator can be chosen for your home. A transfer switch can be quite useful – A generator can’t be plugged into a wall outlet. This is called backfeeding and it is very dangerous. Your house needs to be disconnected from the power grid before the generator starts and that’s what a transfer switch does. The transfer switch has an electrical subpanel that contains a switch for every circuit you want your generator to run. The switch is wired right into the houses electrical service and the generator is plugged into that subpanel so that only generator power runs into your home. Choose the features you want – There are a number of features, such as remote monitoring. You could check the status of your generator from your smartphone or you could have your generator installers monitor your system for you so that they immediately know when there is a problem. 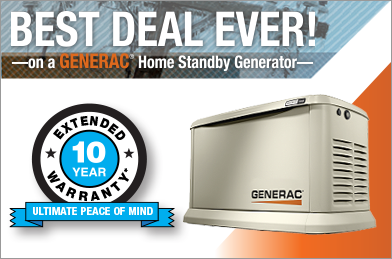 Your generator salesperson will go over your options with you so that you can make an educated decision. When you choose the right generator, you can run all of the electrical items you need to during the power outage without having to worry about your generator.